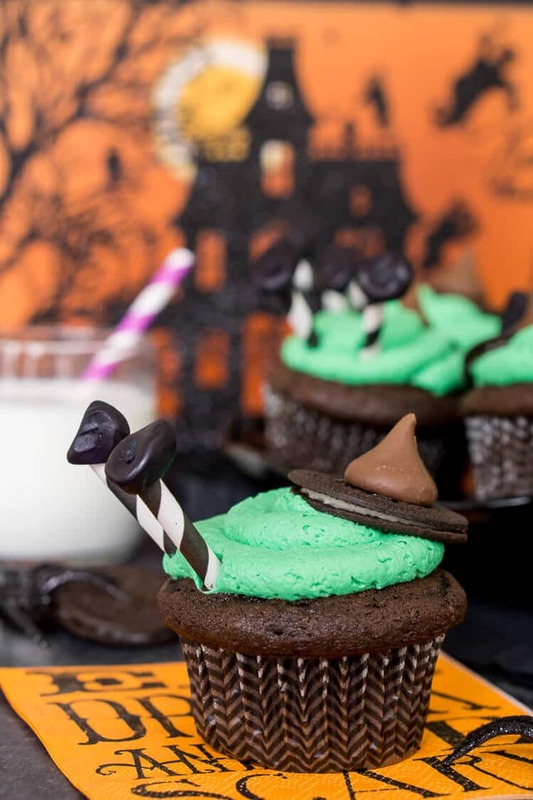 These Melted Witch Cupcakes are fun, cute, and delicious! They’re easy to build and the perfect way to bring the Halloween spirit to life at your party! 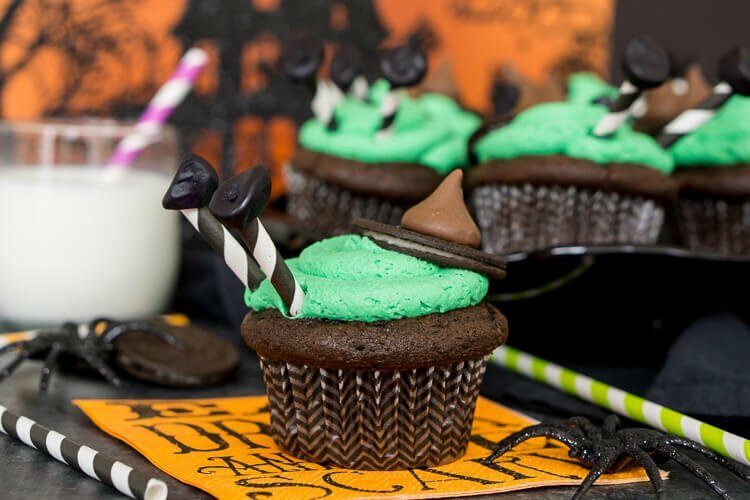 These Melted Witch Cupcakes are an easy and fun treat to make with the kids or serve at a Halloween party! I’m pretty certain I’m way behind the ball on Halloween posts, especially seeing as it’s only a couple weeks away. Since I don’t have kids and this month has been so insane and I’m more looking forward to my trip to Jamaica at the end of the month, I almost forgot about Halloween altogether. But I always like to put out a few seasonal recipes, recipes that are fun and really bring the holiday to life. Halloween definitely isn’t my favorite, but I love the cute black cats, ghosts, and witches. Each year we usually head to my parents for their annual Halloween party, but I’m not really sure what we’re doing this year. Honestly, though, I’d be perfectly happy with staying home and watching Hocus Pocus or another Halloween Movie with Matt. I struggled coming up with ideas for Halloween this year, sometimes I feel that because I don’t have kids and I’m not really a Halloween girl, it’s harder to find inspiration. 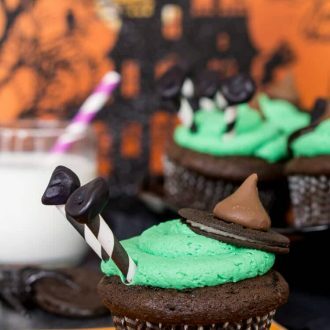 I used the general melted witch cupcakes idea and made them with my favorite chocolate cupcake recipe and my whipped vanilla frosting (dyed green). I wanted to keep the flavors simple for these cupcakes since there are so many fun add-ons with the Oreos, Kisses, and gummies! I think they turned out super cute! Plus you can watch the video below to see just how easy they are to assemble! See, aren’t they the cutest! 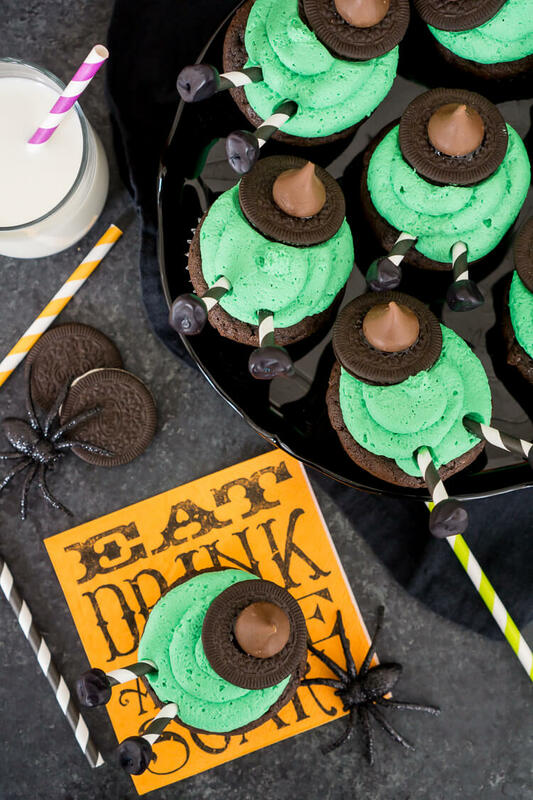 They are perfect for your Halloween parties or to send the kids off to school with! Don’t forget to make my Goosebumps Punch too! 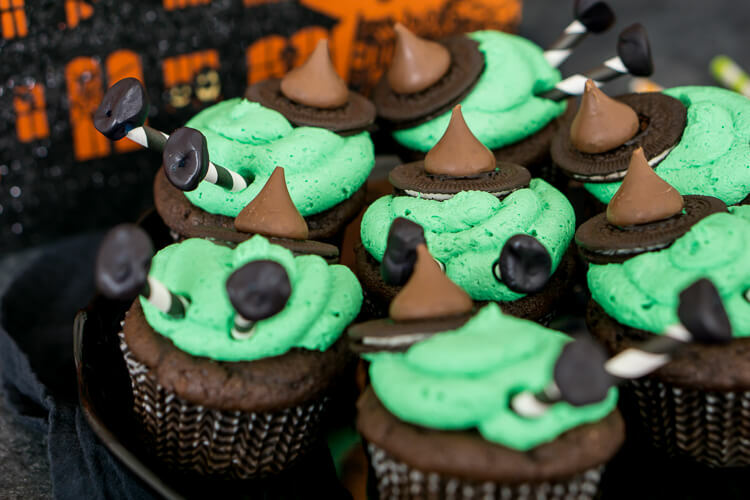 Pin these Melted Witch Cupcakes for Later! 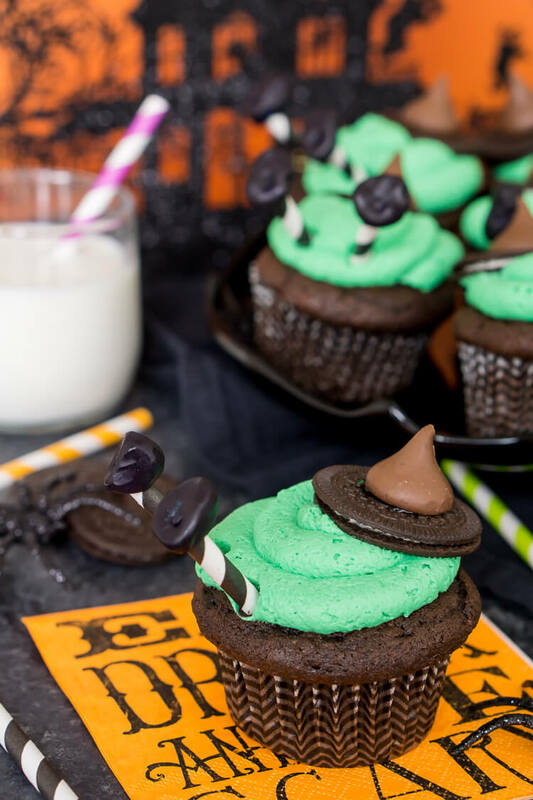 These Melted Witch Cupcakes are fun, cute, and delicious! They're easy to build and the perfect way to bring the Halloween spirit to life at your party! Fill cupcake liners with 1/4 cup batter. Remove from oven and move cupcakes to cooling racks to cool. Once cupcakes have cooled, beat frosting ingredients in a large bowl or stand mixer fitted with a whisk attachment on medium-high speed until light and fluffy, about 2 to 3 minutes. Pipe frosting onto the cooled cupcakes. 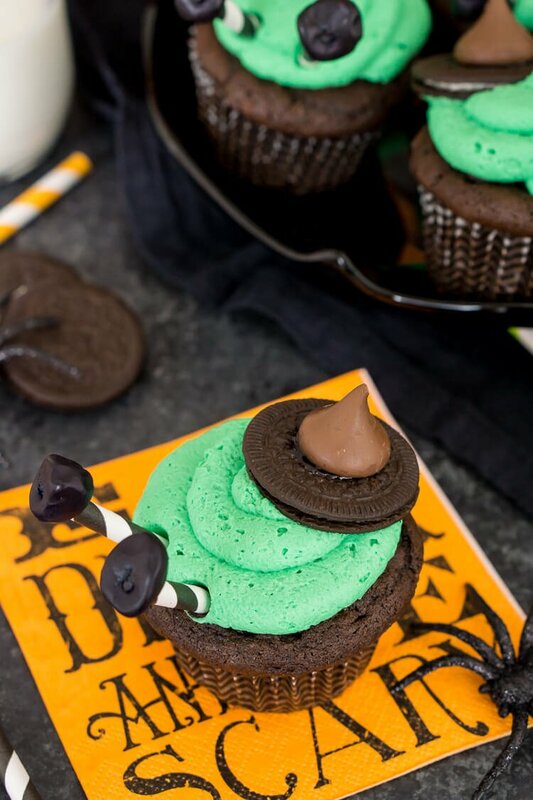 Use a small amount of gel icing or frosting to stick the Hershey Kisses onto the Oreo Thins to make a witch hat, then press it onto the top of the frosted cupcake, repeating for each one. Once the straws have been cut into 2-3 inch pieces, press one gummy onto one end of each of the straws to make legs, then stick two legs into each cupcake. Inspired by Celebrate! by Women's World. Those are so adorable for Halloween! Great idea! These are so simple and so cute! Thanks for sharing! This is awesome! Great Halloween treat! It sure is! Thanks, Meg! Thanks so much, Lane & Holly! You are so creative and love the recipe!